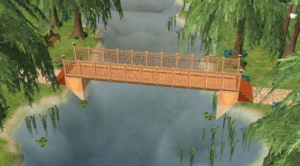 The Sims 2: Nightlife adds to the series with new social activities to take part in, 125 new items to interact with, and a new downtown area with lots of fun and interesting things to do. You can go out on a date using your own car, build a driveway for your vehicle, form a social group, but watch out for the vampires at night. 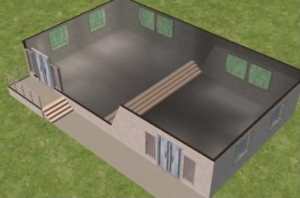 The design of the new buildings included with The Sims 2: Nightlife provides a nice variety of atmosphere and looks for you to explore. You can even create your own wild rooms with unique themes to play in. You can spend many hours exploring the poker hall, upscale restaurants to 50s diners, functional bars and a photo booth with interesting and engaging functionality. 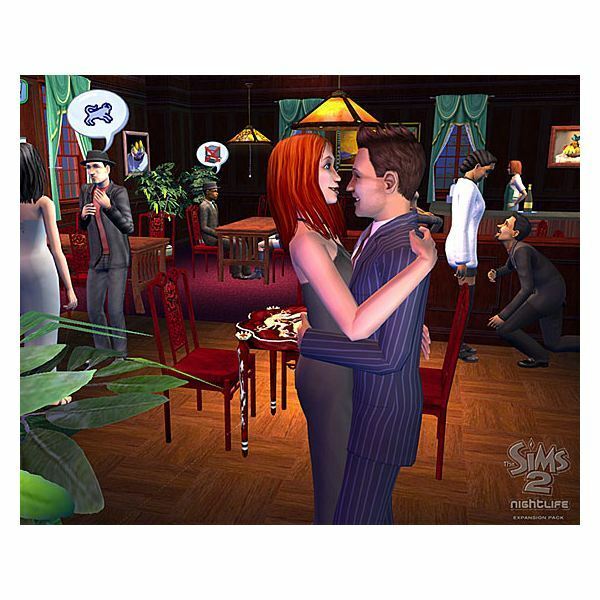 The Sims 2: Nightlife doesn't add anything to the actual gameplay you remember from previous Sims 2 experiences, but it does add to existing gameplay concepts with a lot of additional content. 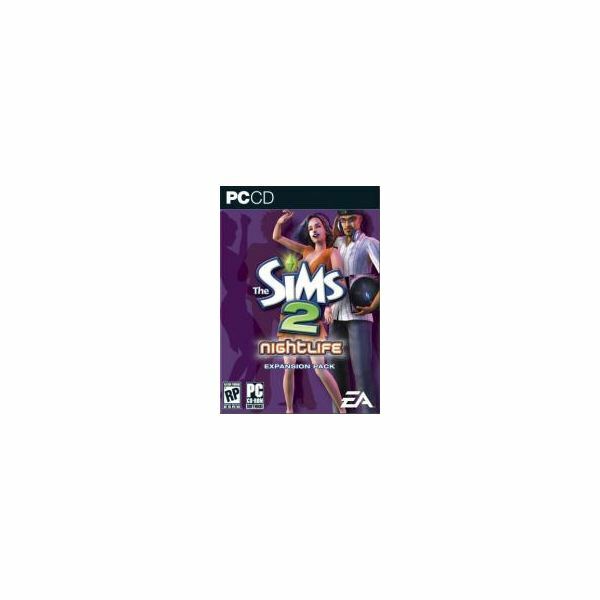 The Sims 2: Nightlife shipped with a few new bugs in the code from earlier titles, which isn't unusual with computer games, but is unfortunate considering they could fix them if they wanted to. Characters would occasionally freeze up during play or quiver in place for a few seconds, and conversational icons would occasionally get mixed up and the text would be an unreadable mess of lines. The new screens with The Sims 2: Nightlife include nicely rendered views of your neighbor's lots from inside your home that really add to the immersive feeling of being part of a neighbourhood. The details and textures included the expansion pack are above average. Your Sims can now eat a nice looking meal that looks reasonably edible, and flirt with a waitress when your date isn't looking. The character models look engaging and attractive enough to keep your attention. The animations in The Sims 2: Nightlife are as smooth as all of The Sims 2 titles. Overall, the developers did a really good job with this expansion. The music stations now play the oldies channel, the new groove channel, and other channels to give you more musical options as you're going about your daily business. It is great to be able to select music while playing The Sims 2: Nightlife or heading downtown to take in the nightlife. The soundtrack is absolutely solid entertainment and all the lyrics are in Simlish (sims lingo), which helps to keep you immersed in The Sims 2 world. 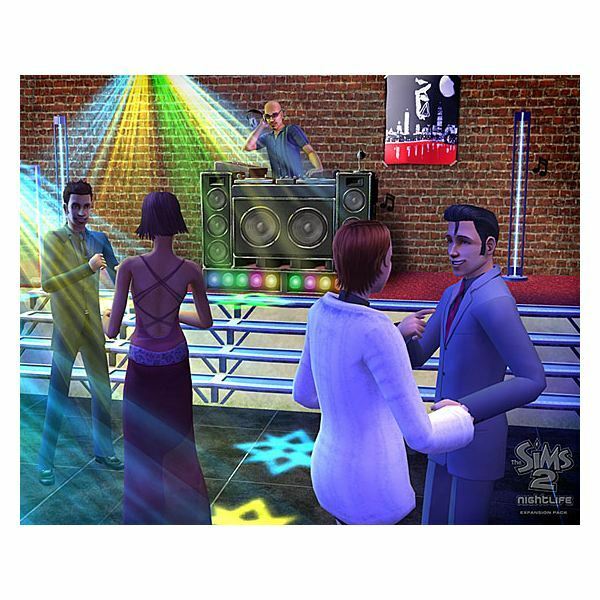 The Sims 2: Nightlife gives you new things to do while living your virtual Sims life that all revolve around new social activities to take part in, including a variety of new activities to explore in the downtown area. You can go on a date with your best girl, play a little poker in the poker hall, try one of the upscale restaurants or stick to the middle of the road by giving the food at the diner a try. 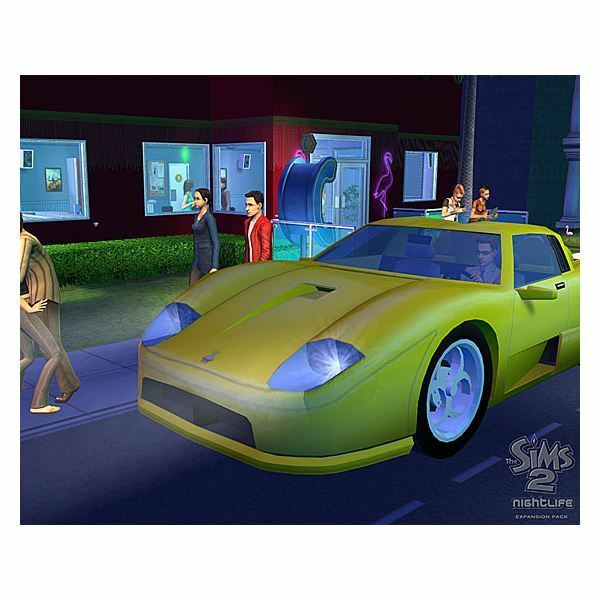 Owning your own car is an option in The Sims 2: Nightlife, you can choose from one of five available cars, and a dozen different paint jobs. After you're finished customizing your ride take your girl out for a drive, turn the radio on, and sit side by side; amazing functionality makes this option a lot of fun. The Sims 2: Nightlife even has Sim vampires, and you can become a red-eyed, pale-skinned, blood-sucker yourself if you want to, but you'll have to be bitten by the master vampire who hangs around at night. The Sims 2: Nightlife adds nothing new to the old Sims 2 gameplay, but it is a satisfying and engaging experience, so this is still a good thing. The Sims 2: Nightlife has really high replayability. You can spend hours and hours exploring the downtown area. Add to this the ability to customize your own community space with a unique look in tune with your own personality, a fun and engaging social system that works painlessly and has a very low learning curve, and enough variety in all aspects of game design to keep you coming back for more. What more can you ask for in a Sims game?